Re: Chemtrails working as planned. Trump elected. Ah, that's what's going on with my device recently. It's been making me remotely view a newer one. That makes sense: Trump looks like he got a chemtrail full in the face. Thanks, but... 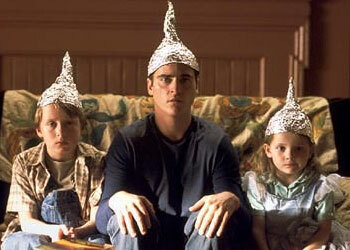 I wouldn't trust prefabricated tin foil hats, even if it's a lizard overlord version. I'm going with home made stuff. ElectricMonk wrote: That makes sense: Trump looks like he got a chemtrail full in the face. Speaking of chemtrails, I have a serious question. There are circumstances when pilots engage in fuel dumping before landing so as to prevent a catastrophic fire and/or explosion (remember 911) in case they crash. The real estate around major airports seems to be occupied by shoddy trailer parks with poverty-stricken people. Can aviation fuel from fuel dumping be affecting the long-term health of these underserved, poorly-protected people (poorly protected because of the shoddy construction and living conditions), and can the whole chemtrail thing be an exaggeration of the well-established practice of fuel dumping? By dismissing chemtrails in their entirety, are we dismissing the valid health concerns of a whole subset of people? Fuel is only dumped before landing in case of extreme emergency; it's almost never necessary and it would be very costly. I would say that around most airports it has never happened, but I don't have the statistics available to back up my feeling. Airports tend to be surrounded by cheap real estate (commercial or residential) because they are unpleasant to be around due to the noise and light pollution, not the chemical pollution. Austin Harper wrote: Fuel is only dumped before landing in case of extreme emergency; it's almost never necessary and it would be very costly. Fuel dumping can also be performed if a flight is rerouted to a nearer landing field, and hasn't burnt as much fuel as it expected to. Aircraft are expected to weigh less when they land, so they have two maximum weight allowances: the maximum takeoff weight and the maximum structural landing weight. An overweight landing can cause damage to the plane, and may cost more in repairs than the cost of the fuel, so dumping the fuel would be the more economical thing to do. But some commercial airliners (like the 757) weren't even designed to perform fuel dumps, so they end up flying around in circles until they've burnt off enough fuel to reduce weight. In an extreme emergency, it just lands whether it's overweight or not. The dumping itself wouldn`t happen near an airport, given the speeds they fly at. Instead it would happen 40, 50, 60 miles or more away from an airport. I think I remember seeing a news report about a case at LAX a few years ago. The plane was circling with a jammed landing gear or something and a (possible?) fuel dump over the ocean mentioned. That sounds familiar. Did you google it? It might have been JetBlue Flight 292 but they didn't perform a fuel dump; they flew "in a figure eight pattern between Bob Hope Airport in Burbank and LAX for more than two hours in order to burn fuel". However, there is this bit of information: "The Airbus A320 does not have the mechanical facility to dump fuel, despite various news agencies reporting that the aircraft was doing so over the ocean." That looks like what my noogle remembered. Thanks. Oh, and I found out another reason why a plane might perform a fuel dump: A military refueling plane that has its receiving planes cancelled can be allowed to dump fuel rather than, say, send up other planes to fuel up then fly around for 8 hours to burn it all off. Writing your name in the snow from 35,000 ft is quite an art. Gord wrote: But some commercial airliners (like the 757) weren't even designed to perform fuel dumps, so they end up flying around in circles until they've burnt off enough fuel to reduce weight. "The advantage of afterburning is significantly increased thrust; the disadvantage is its very high fuel consumption"
If we fit 757s with afterburners, the pilots could do some very fast barrel rolls, loop the loops and supersonic, very low, passes over cities. As they are burning up fuel faster, they can land faster. That way the passengers will remain calm and not suspect anything out of the ordinary is going on. "If you look out your window, you will see the Earth hovering gracefully above us in all of God's majesty OH CRAP! ...Haha, it's okay folks, I got this!..." Except.... all the nutters out there would be claiming that they personally met aliens, were probed, whisked off to another planet and returned to earth, all before breakfast. And they would have proof too – fuzzy videos. since one of the articles is obviously Fake News, the other must be the Truth! The only way to know which is which is to spot the one written by and then leaked by Trump himself. Do either of them contain the words "yuge" or "Jina"?